Whether you’re trying to design a unique team-building exercise or are just seeking a fun adrenaline rush, Aggression Paintball offers private party games. Private party games are the ideal choice for birthday parties, bachelor parties, corporate outings and team building exercises. We can customize a private party package to match your group's size, age range, experience and desired playtime. various courses throughout the day and enjoy multiple game types and scenarios. Since it is a private outing, your group will have the entire field to yourselves for a specific block of playtime. Outside players are not permitted to play with your group, unless you decide to invite them. For your safety, all private games include group referees who will organize and supervise your game from start to finish. Before the start of every private session, an Aggression Paintball staff member will give your group a thorough orientation, explaining safety measures and game rules as well as demonstrating how to operate your rental equipment. How and where do I make my payment? All deposits and prepayments are to be made through our location either in person, by U.S. Mail, over the phone with a credit card or online using PayPal. Acceptable forms of payment include cash, check, Visa, MasterCard, American Express and Discover. Contact Aggression Paintball at (806) 383-5688 for more information on reserving a private game. What does the private game include? 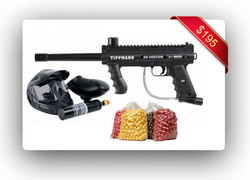 The group rate includes 2 hours of private playtime, a semi-automatic paintball marker, your first tank of air needed to operate the marker, eye and face protection and 500 paintballs per person. How many people are needed to qualify for a private game? A minimum of 10 players is needed. Private games need to be reserved at least one week in advance. Aggression Paintball requires a $100 deposit to guarantee your reservation. If you have not provided us with your deposit in the form of cash, check, credit card or PayPal payment, you do not have a reservation. How soon should I book my game? To reserve a private game, a minimum deposit of $100 must be paid at least one week in advance. When booking during peak times, especially weekends, we recommend paying your deposit as soon as you have secured a date and time. This will ensure your spot is reserved and guarantee that no other group may book that session. All reservations are taken on a first come, first served basis. If you have not provided us with some form of payment (i.e. cash, check or credit card) to cover the deposit, you do not have a reservation. What if I get more players at a later date? Additional players are welcomed to join your group on the day of play and will be charged whatever group rate you have reserved under. A few extra players are never a problem, but please notify us beforehand if it’s likely your group grows much larger than anticipated so we can plan accordingly. What if my group is missing players? Can my players bring their own equipment? If a player chooses to use their own marker, they are responsible for providing all the necessary components to play (i.e. tank, hopper, barrel cover, etc.). We will not separate any of our rental guns for players missing pieces. If a player needs to use a barrel cover for the day, Aggression Paintball makes them available for purchase only for $3. Whether a player is using their own equipment or not, everyone, including players in a private groups, must use field paint only! All deposits and prepayments are to be made through our location either in person, or over the phone with a credit card. Acceptable forms of payment include cash, Visa, MasterCard. Contact Aggression Paintball at (806) 383-5688 for more information on reserving a private game. Will we need more paintballs than are provided? Valid Aggression Paintball Memberships are accepted for discounts. All paintballs must be purchased at the playing field on the day of play for private parties. There are no exceptions to this rule. We play rain or shine. If we deem lightning or weather to be unsafe, we will delay outdoor games or reschedule. Keep in mind that while there may be lightning where you live, it may not be at the field. ***NOTE: Once a private game session is finished, players are allowed to join the open play session as long as it's still operating free of charge. This guide was designed to answer the most frequently asked questions regarding group rates and policies. If you have additional questions, please call our main office/retail store at (806) 383-5688. We reserve the right to modify company policies at any time.